The activity tracker requires IOS 7.1 & Android 4.4 and above,Bluetooth 4.0(Smartphone only,not for PC, iPad or Tablet). Color Screen:OLED 0.96inch color display screen. Waterproof Level:With waterproof class of IP67, to easy your daily use. Multi-Sport Modes:6 exercise modes(Running,walking,riding,palying tennis,playing badminton,playing table tennis). Call Reminder: The tracker vibrates and call is displayed on screen when your phone receive an incoming call. SNS Reminder:Enable the function to receive notifications from other apps (Instergram, Facebook, Twitter,WhatsApp, Linkedin, Messenger, etc. ) on your tracker screen. SMS Reminder: Enable the function to read incoming text message on your tracker screen. Sedentary Reminder:Set reminders for periods of time of inactivity. Alarm Reminder:Set silent alarms on the tracker to wake you up and not disturb your families. Shake to Take Picture:In the App shake to take picture mode could remotely control photography shooting. Wrist Sense:The screen is automatically lightened up when you turn your wrist towards you. 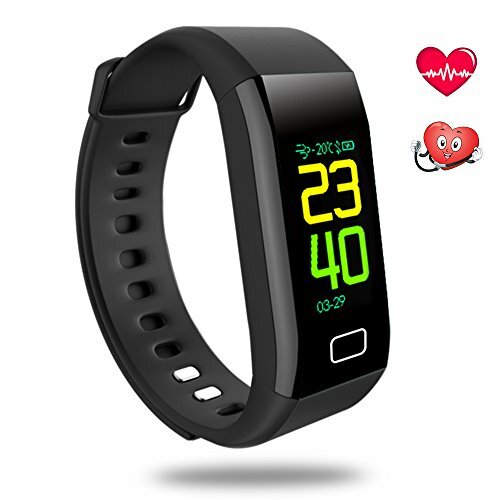 Guides you to healthy habits in life:Heart rate and blood pressure monitor.All day activity tracking(like steps, distance, calories burned and sleep monitoring).